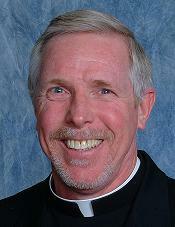 Richard Benson, CM, is a Vincentian Father, a member of the Congregation of the Mission, Province of the West. Currently he is the Academic Dean and Chair of the Moral Theology Department at St. John’s Seminary in Camarillo, California. He teaches fundamental moral theology, Catholic social teaching (social justice), and Catholic bioethics. He obtained a BA in philosophy from St. Mary’s Seminary in Perryville, Missouri, in 1974, and a MDiv and a MA (theology) from De Andreis Institute of Theology in Lemont, Illinois, in 1978. He was ordained a Catholic priest in 1978. He obtained a third MA (biological sciences) in 1980 from California State University Dominquez Hills. Finally, he obtained a STL (License in Sacred Theology) in 1990 from the Katholieke Universiteit Leuven (Catholic University of Louvain) in Belgium and a PhD and STD (Doctorate in Sacred Theology) from the same university in 1993. Those of us who enjoyed Catholic parochial education prior to the Second Vatican Council would recognize the dialogue above as a very traditional method of Catholic religious education based on the popular and almost ubiquitous Baltimore Catechism. The caricature of Catholic religious education that many non-Catholics have been able to experience through the play Late Nite Catechism, although a bit over the top, is humorously and somewhat frighteningly authentic. However, it is clear that the tradition of memorizing the questions and answers in a catechism was honored for centuries in both Catholic and non-Catholic Christian communities as a trusted method of religious education, especially of youth and converts. Unfortunately, this particular tradition has been exaggerated to almost mythic proportions. Would it be fair to say that the example presented is the only model of religious tradition for theological learning? Let’s hope not. Nevertheless, religious traditions have, too often perhaps, been viewed as obstacles to serious inquiry and thus to real education. After all, how can students learn authentically if they are told that there are notional, theoretical, or practical moral boundaries that cannot be crossed in pursuit of intellectual honesty? Is not learning reduced simply to pantomime in such a situation? Isn’t this just another clear example of education reduced to indoctrination? Can any real learning take place in an educational arena that is artificially circumscribed? Is it at all possible that, of all things, religious tradition just might provide an integrating framework that helps form an authentic and useful theological imagination? Wouldn’t it more than likely do just the opposite? Before we rush to judgment, let’s take a closer look. Without moving into a complex and systematic analysis of exactly what comprises “religious tradition,” I would venture that, in general, religious tradition can define the space where legitimate theological inquiry can happen. In fact, it could be argued that without a tradition, integration is impossible. Without a tradition integration might be nothing more than a narcissistic enterprise. One is reminded of the fact that in the wonderful play The Fiddler on the Roof, the father, Tevye, did his remarkably honest and powerful theological reflections within his own religious tradition. For example, in our seminary the definition of theological inquiry proposed in the eleventh century still remains both useful and used: “fides querens intellectum” or faith seeking understanding. Students learn within a tradition that not only encourages but demands that theology define itself as a “work in progress.” Theology as it is practiced and taught at St. John’s attempts to engage a community of learners in an ongoing work that belongs to the entire church, that is of understanding ever more deeply the meaning of divine revelation and its implications for discipleship. Seminarians learn that their Catholic tradition does not stifle creative inquiry, but rather encourages it as constitutive of the theological enterprise. Theology seen in this way can never be reduced to the repetition of dogma, but rather is an open study of the truths of revelation with every tool of intellectual inquiry available. Across the curriculum, the word “why” must be encouraged, not discouraged. Truth can never be afraid of inquiry or investigation. On the contrary, it must invite it. For example, there are some who would suggest that the notions of “evolution” and “natural selection” are incompatible with Christianity. The Catholic theological tradition would not be so quick to allow such a conclusion. The Catholic tradition sees faith and reason as complementary partners in the search for truth, and provides both space and boundaries for an intellectually honest discussion of these notions. Is it reasonable to believe that the Bible in general, and the book of Genesis in particular, is true but at the same time does not need to be scientifically or historical accurate to convey divine truth? The Catholic response is that the creationism – evolution debate is in most of its aspects a scientific one, not a theological one, and therefore one cannot judge one’s Christian authenticity by one’s scientific conclusion. This particular aspect of the Catholic religious tradition that allows the engagement of philosophy in the service of theology, encouraging faith and reason to walk side by side, provides a useful point of departure for theological education at the beginning of every one of our students’ studies and a valid means of integration throughout the educational process. Students who bring their theological conclusions with them to the seminary find themselves confronted by professors asking them to enter into a tradition that challenges assumptions and conclusions that disrespect religious tradition. Thus rather than a hindrance to authentic inquiry, religious tradition often provides a very legitimate context for real learning. My own field is moral theology. I have found that one of the most effective methods of learning the Catholic moral tradition is to have the students engage and memorize traditional moral terms and principles in Latin. I do this because in Latin the principles (three font principle, the principle of double effect, etc.) are expressed so succinctly and because the students feel that, by appropriating traditional moral vocabulary in Latin, they are in touch with a tradition in a way impossible by relying only on contemporary translation. Real fun and real learning ensues when the students are confronted in class with contemporary moral cases and begin publicly discussing how these traditional terms and principles, some centuries old, can be helpful in solving contemporary moral dilemmas and consequently be valuable in pastoral ministry. I have the privilege of working in a Catholic seminary that resembles the church it serves. The Catholic Church of Southern California is at one and the same time both a local and a world church. Every weekend in the Archdiocese of Los Angeles, the Eucharist is celebrated regularly in over forty different languages. Our seminary is arguably one of the most multiculturally diverse Catholic seminaries in the United States. Our white students are a minority of our population. While only a small percentage of our students are “international” students preparing to return to their home dioceses, almost half of the rest were born outside the U.S. Our learning community is wonderfully diverse and our students represent a rich resource for learning. Students bring not only their own cultural vision and understanding of the world and the Catholic church; they bring particular learning styles that often are incompatible with a pure Western, Euro-American approach. For example, U.S.-born, Euro-American students have been raised in a liberal atmosphere of individualism that encourages the development and sharing of ideas and so they are often ready and even anxious to share their opinions, whether in or out of class, on just about any subject (many times without much forethought), whereas students from other cultures may come with a very different approach to society and education. They may be decidedly less individualist, more communally centered. In the same vein, they may have been conditioned to understand that the role of the student is to listen to the experts (teacher) and give back the wisdom and truth they have been told. These students may be generally less willing to enter into the American free-for-all of intellectual debate. A familiar religious tradition provides a safe space for them to participate in their education in a confusing cultural context different from their own. The dialogical method of inquiry present in the Catholic religious tradition is but one example of a religious tradition that is effective for learning here at St. John’s. It offers a process of integration that allows the learning at our seminary to cross cultural boundaries. Students are encouraged to apply the insights of their learning to the particular cultures from which they come. Dialogue is not about competition but about complementarity. The tradition provides a common center, but students are encouraged to make reasonable and creative responses that move to the periphery, responses that are traditional but creative. Working within an authentic religious tradition can be far from stultifying — rather it can provide a factor that is unifying, encouraging a community of learners, but without reducing itself to a cookie-cutter approach to education. Students who complete their work at our seminary take away a sense of owning their tradition, but at the same time they know that they have been empowered to understand and apply that tradition in different contexts. The multicultural context in which they have been learning has provided them with the challenge to understand the Catholic religious tradition from within their own cultural context while being sensitive to the fact that “one size does not fit all.” The Vietnamese seminarian needs to be sensitive to the importance of the Quincenera celebration within the Mexican Catholic culture. The Euro-American seminarian needs to understand that not all Spanish-speaking Catholics are Mexican, enjoy spicy food, and have a devotion to Our Lady of Guadalupe. Religious tradition, to be a truly integrative force, needs to be integrated into and nuanced by culture, but without loosening its boundaries or losing its essential identity.